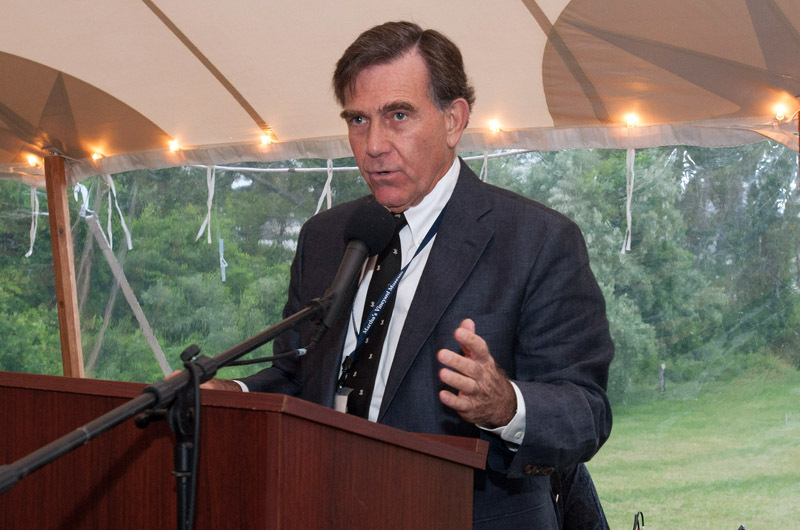 Evening of Discovery was held at Marine Hospital, future site of the Martha's Vineyard Museum. 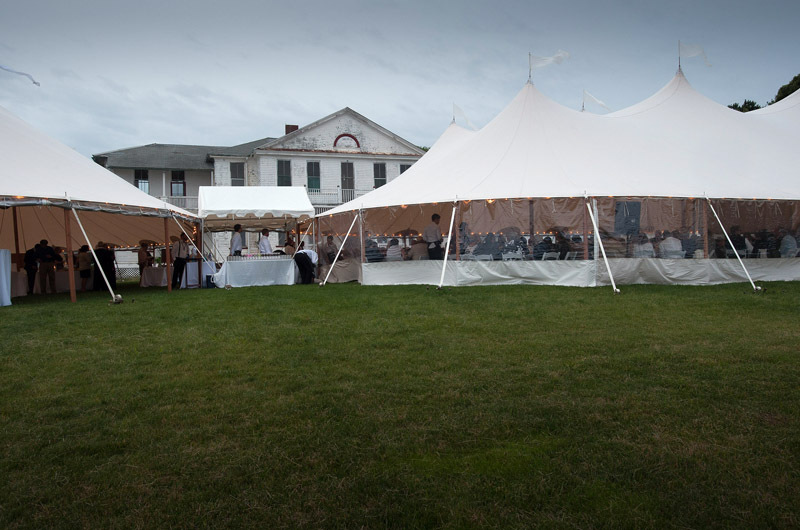 The Martha’s Vineyard Museum hosted its 17th annual Evening of Discovery gala Saturday at the former Marine Hospital in Vineyard Haven as part of an ongoing fundraising effort for the coming year. The event raised about $200,000 for the museum. Around 400 guests attended this year, a record high for the event. The dress theme of the evening was black and white, in the style of Alfred Eisenstaedt’s photographs of the Island, which are currently running as part of the Spotlight Gallery at the museum. The exhibit, entitled Identifying Eisenstaedt, invites guests try and identify the people and places in many of Mr. Eisenstaedt’s pieces from the 1930s onwards. So far, many visitors to the museum have been fairly successful in doing so, writing down names and places beneath the photographs, which are on exhibit in the Spotlight Gallery where notable objects from the past are on rotating display. Several of Mr. Eisenstaedt’s photographs were on display Saturday night for guests to examine as they sipped drinks or chatted with tablemates. In keeping with the theme of the night, there was even a photo booth set up on the grounds for guests to take pictures in their black and white attire. The evening began around 6 p.m. with cocktails and a silent auction. Up for bid were items ranging from a tour of the set of Downton Abbey to an original Eisenstaedt photograph. Sixty-five items in total were auctioned off, along with a series of grab bags filled with items like Vineyard Vines ties and magazine subscriptions. The proceeds for the evening were primarily directed at the ongoing operations costs of running the museum, rather than any specific new initiatives. Members of the museum’s board also gave remarks on the ongoing project to relocate the museum to the former Marine Hospital in Vineyard Haven. The museum is hoping to move to the new space by 2017, and while funds from the evening were pledged to support the relocation specifically, the event still helped to provide a stream of donations for the museum and gave attendees an update on the progress of the capital campaign for the move. Before dinner, guests could even look inside the hospital’s interior, and see the museum’s plan for remodeling the space. 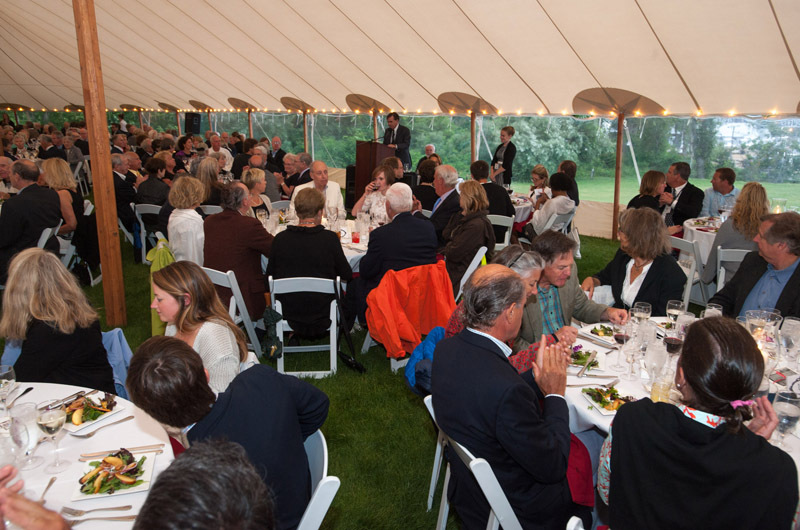 After remarks by museum executive director David Nathans, guests were served dinner by the museum’s summer interns, who had worked throughout the evening to help execute the event. Later, guests were shown a brief video on the progress of the museum’s education program, including updates on the National Endowment for the Humanities grant the museum received as well as the opening of the new museum’s new Morgan Learning Center in Vineyard Haven. As the evening wound down at about 9 p.m., guests were given copies of Island Stories: Highlights from the Martha’s Vineyard Museum, which catalogues 50 unique objects the museum has to offer. The book came as a fitting conclusion to a night that celebrated all that both residents and visitors can find at the museum, which is made possible by funds raised at events like the Evening of Discovery.